Barbur Boulevard in Portland is one of the city’s most deadly streets, and advocates there have pushed for a road diet that would slow traffic and provide comfortable space for biking and walking. But the state DOT has refused to change the road, in large part due to objections from the local chamber of commerce. Converting one northbound traffic lane on 1.9 miles of SW Barbur Boulevard to two protected bike lanes with sidewalks would apparently prevent unsafe weaving during off-peak hours without massive impacts to morning traffic. 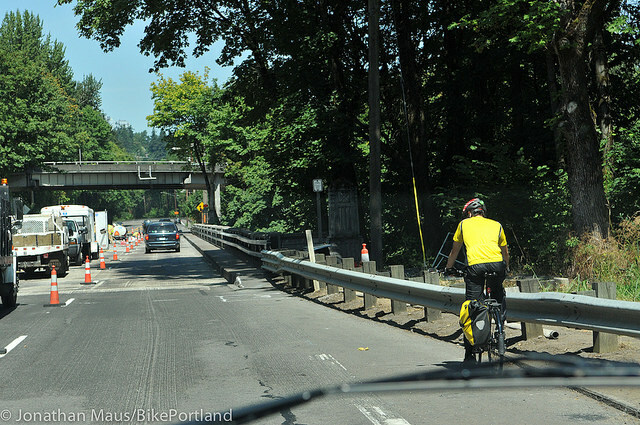 That’s one conclusion from data released Friday that analyzed changes to people’s driving habits during construction work on Barbur this summer. A repaving project had temporarily closed one traffic lane in each direction. The study, led by the Oregon Department of Transportation because Barbur is a state highway, found that temporarily narrowing Barbur to two lanes at this point had added 68 seconds to the average northbound rush-hour trip. However, that delay — a slowdown of about 23 percent for the length of this 1.9-mile stretch of road, from about 30 mph on average to about 24 mph — apparently bothered almost no drivers enough for them to switch routes. Moreover, the proportion of northbound drivers who had been speeding at 55 mph or faster through this stretch during non-rush hours — often by weaving rapidly through midday or early evening traffic — plummeted 68 percent during the lane reduction, according to the same data set used in the study. Elsewhere on the Network today: Streets.mn says crowded Twin Cities buses might be better off with less seating. Greater Greater Washington shows how Maryland’s rural areas rely on suburban and urban areas for financial support. And Urban Milwaukee reports on the political fissures forming as the city develops its starter streetcar route.